Image Size: 29 X 19 in. Image Size: 40 X 25 in. 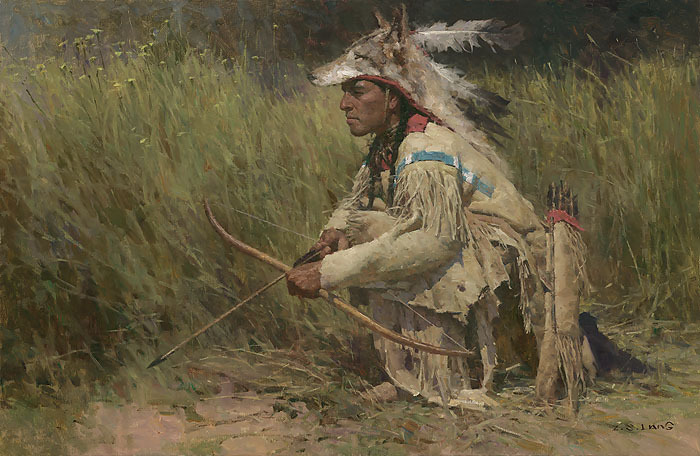 This Southern Piegan hunter is patiently waiting for a small group of buffalo coming to the river bank for water, wearing a wolf pelt with golden eagle feathers for his hunting medicine. Since the wolf and the eagle are great hunters, the Indian believed this medicine will bring him success. This is a portrait of a man at one with his world, part of the cycle of hunting, eating and utilizing every part of the animal.